To our new and returning school families, welcome to the 2018-2019 school year! If you are unfamiliar with the Cougar News, this is the weekly school newsletter that is sent out every Thursday. It will contain important information regarding upcoming events, reminders from our Finance Manager Connie Lanzisera, sign-ups for sporting teams and much more. We believe that communication between home and school is of great importance, so we encourage you to read through the Cougar News each week. 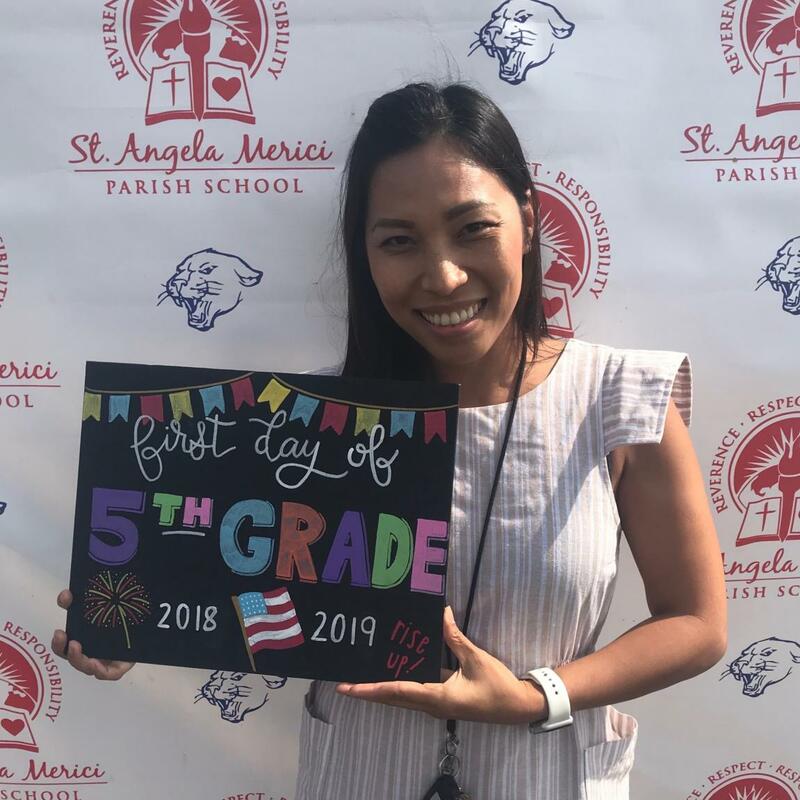 Mrs. Ivy Hoang, 5th grade teacher, can be reached at gro.a1556000111erbal1556000111egnat1556000111s@gna1556000111uhi1556000111" >gro.a1556000111erbal1556000111egnat1556000111s@gna1556000111uhi1556000111. Mrs. Serena Lambert will be in the Front Office from 1:00 – 4:00 PM, and can be reached at gro.a1556000111erbal1556000111egnat1556000111s@tre1556000111bmals1556000111" >gro.a1556000111erbal1556000111egnat1556000111s@tre1556000111bmals1556000111. Ms. Gemma, Extended Care assistant, can be reached at gro.a1556000111erbal1556000111egnat1556000111s@era1556000111cdedn1556000111etxe1556000111" >gro.a1556000111erbal1556000111egnat1556000111s@era1556000111cdedn1556000111etxe1556000111. 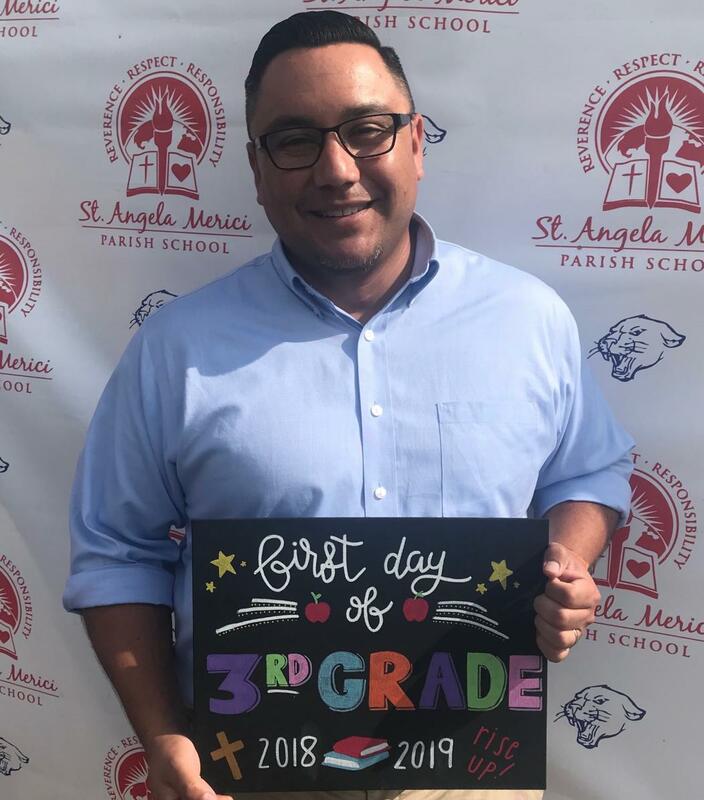 Mr. Mike Salas is our long-term substitute 3rd grade teacher while Mrs. Grasko bonds with her new bundle of joy. He can be reached at gro.a1556000111erbal1556000111egnat1556000111s@sal1556000111asm1556000111" >gro.a1556000111erbal1556000111egnat1556000111s@sal1556000111asm1556000111. To ensure the safety of our students and teachers, we ask that you abide by the following directions regarding morning and afternoon carline procedures. Morning Drop-off: Enter the parking lot by the Walnut Street entrance. Follow the red line (as seen in the picture below), stop and unload passengers as directed by the supervisors. Turn left and exit on Fir Street after drop off. 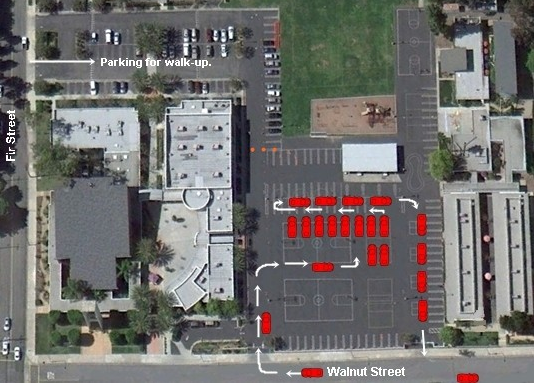 Parents who wish to walk their children up to the classroom may park in the Fir Street parking lot. Afternoon Pick-up: The gate will open at 2:30 PM for parents to line up for carline. Children are brought out from the classes and stand in their designated areas, and are released to their parent once their car has reached the front of the school. Follow the traffic pattern pictured below. 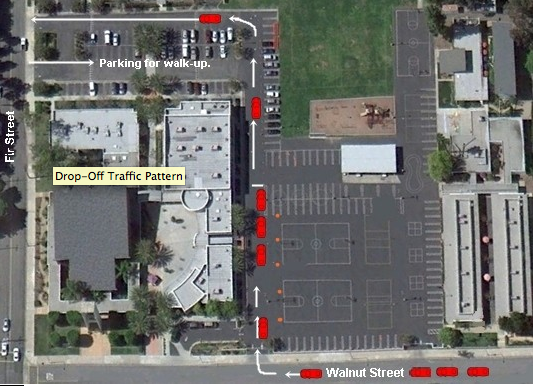 Parents who wish to walk and pick up their children may park in the Fir Street parking lot and wait outside the library or under the lunch shelter. A supervisor will walk the students through the Tunnel of Knowledge to meet their parents. Remember to always drive slowly and never use your cell phone while driving. Be very respectful to the adult volunteers and staff members, and always watch for pedestrians. 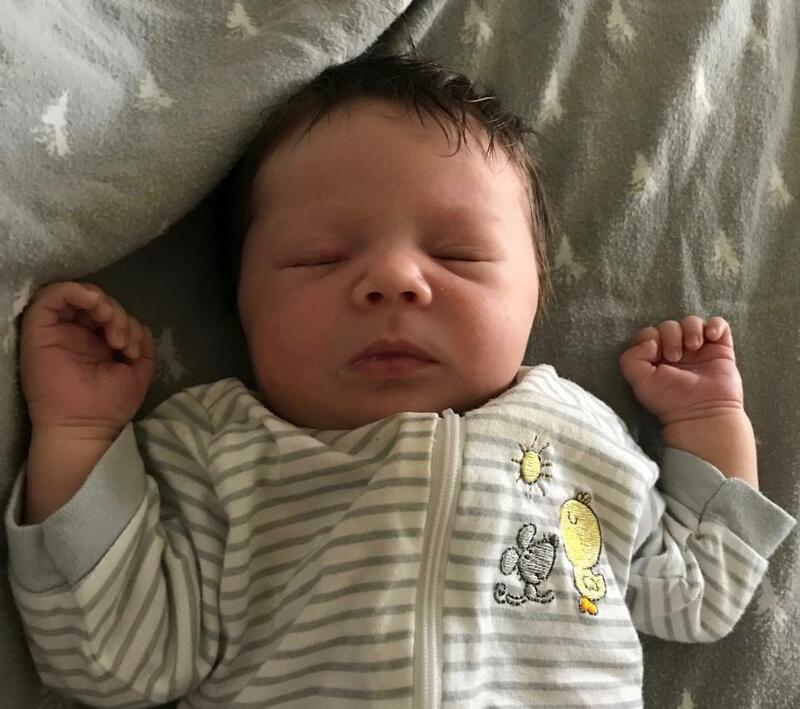 Congratulations to 3rd grade teacher Mrs. Grasko on the birth of her second daughter, Kellen Joyce Grasko! She was born 8 lbs., 9 0z. and 21 inches long. 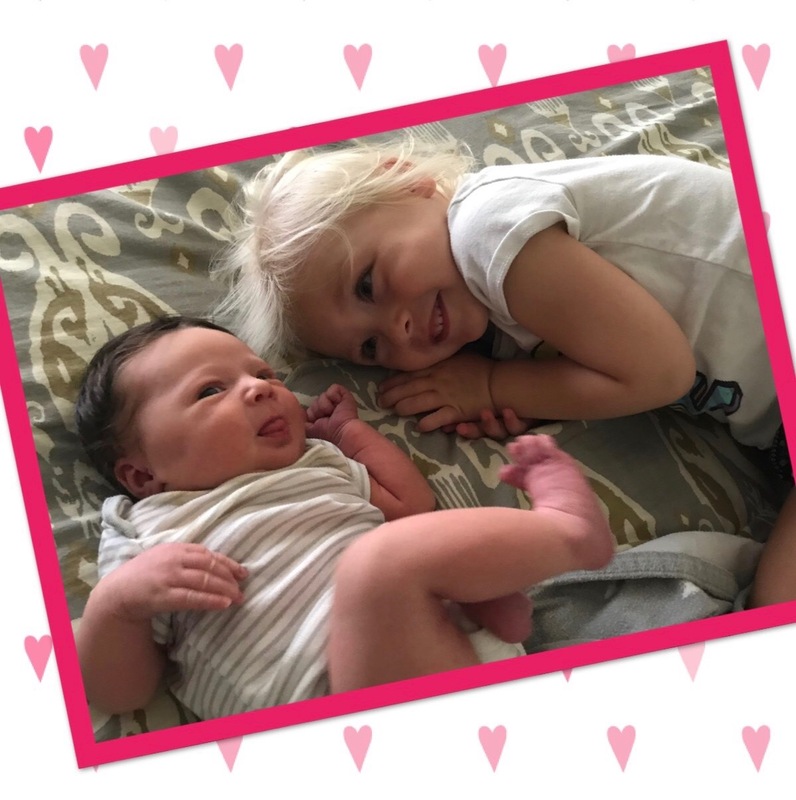 We wish Mrs. Grasko a wonderful, relaxing maternity leave and a lifetime of happiness with her new baby! Congratulations! The Welcome Back Eucharist is tomorrow, Friday, August 31st at 10:30 AM. Parents and family are welcome to attend. Students are required to wear formal attire. For questions regarding formal attire and other uniform policies, please refer to the Parent Handbook, which can be found on our website or in the “Documents” section of Sycamore. The first General Parent Meeting will be held next Wednesday, September 9th, at 6:30 PM. Parents are required to attend as part of their commitment to St. Angela Merici Parish School. Register now for the school band and violin program! Forms, which can be found in the Front Office, are due by September 11th. The first lesson later next month on September 26th. The annual Fall Book Fair is right around the corner! On September 17th through the 21st, books for all ages will be on sale, including picture books, early chapter books, novels, fiction, non-fiction and so much more. A large portion of the books will be newly released books. There will be no school held on Monday, September 3rd, in observance of Labor Day. Individual school photos will be next Thursday, September 6th. Students are required to wear formal attire. The annual Fall Book Fair will be September 17th – 21st. Many of the books for sale will be new releases; don’t miss out! Email all information to gro.a1556000111erbal1556000111egnat1556000111s@nay1556000111rj1556000111" >gro.a1556000111erbal1556000111egnat1556000111s@nay1556000111rj1556000111 (cc: gro.a1556000111erbal1556000111egnat1556000111s@aip1556000111atj1556000111" >gro.a1556000111erbal1556000111egnat1556000111s@aip1556000111atj1556000111) by Wednesday afternoon.